Book through Klook and avail of tickets to enter one of Bangkok’s best premium attractions! There was no Klook desk inside at 10-12.00. we need to wait 20min while staff check our tickets. Klook waste our time - we can get to reception before the visiting at the evening. Very crowded place. great views but poor organization on the roof - cocktails 160-500 bath but we buy them and were need to sit on the floor (there is not to much tables,). Bangkok’s full ceremonial name dubs it with extolling monikers, such as the “City of Angels”, “the Great City of the Immortals”, “Home of Gods Incarnate”, and “the Seat of the King”. 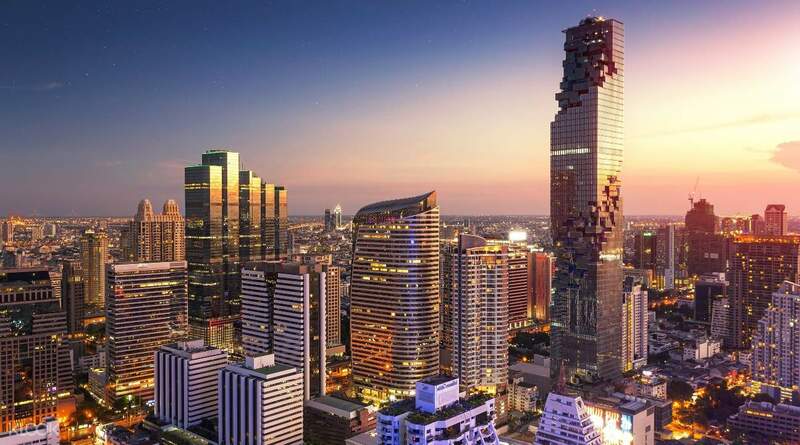 Book through Klook, avail of tickets to enter the King Power Mahanakhon Tower’s SkyWalk, and discover why Thailand’s magnificent capital was given these titles! The SkyWalk will provide you with jaw-dropping views of this vibrant city from a breathtaking vantage point! You’ll surely feel like you’re in heaven as you stand at the very top of one of the highest points in the city while marveling at the bustling streets and buildings below. You can enter the edifice at any time between 10:00am to 11:00pm. You can look at the city in all its morning glory, under a sublime dusk skyline, or see it burst into life in the evening with a dazzling array of colorful nightlights. This is definitely a must-visit attraction for any tourist dropping by Bangkok. 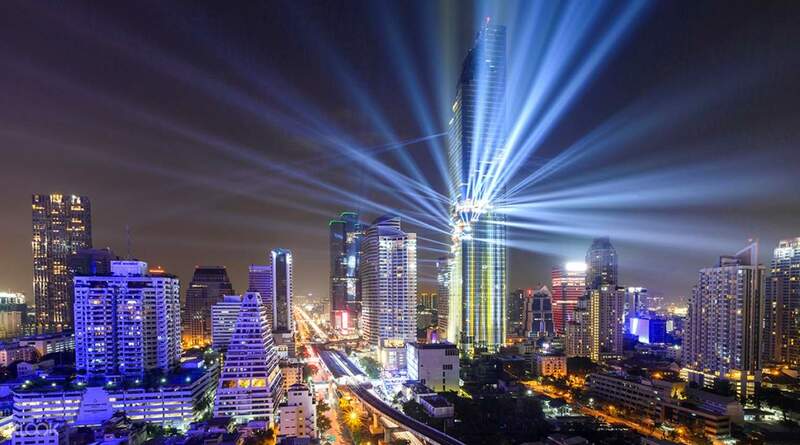 Book through Klook and get to enter Bangkok's King Power Mahanakhon SkyWalk! Enter the SkyWalk in the evening and look at Thailand's capital lit up by nightlights! Had a nice view from above. All was good till reach the glass area where there was a queue. But it was not actually a queue but some people hiding away from the sun. Made to wait for a while till there's a movement ahead. Had a nice view from above. All was good till reach the glass area where there was a queue. But it was not actually a queue but some people hiding away from the sun. Made to wait for a while till there's a movement ahead. what can you say? The views were spectacular, and the Skywalk wasn't entirely awesome experience. There is wonderful music, a great DJ, and a wide selection of beverages to increase your enjoyment. Check it out if you have the opportunity! what can you say? The views were spectacular, and the Skywalk wasn't entirely awesome experience. There is wonderful music, a great DJ, and a wide selection of beverages to increase your enjoyment. Check it out if you have the opportunity! The most wonderful experience. We had so much fun there. I would recommend to go there is almost sunset. Because the view is amazing. The elevator is really fast. And there was a DJ playing good music. You should definitely experience this!! This is worth the money. The most wonderful experience. We had so much fun there. I would recommend to go there is almost sunset. Because the view is amazing. The elevator is really fast. And there was a DJ playing good music. You should definitely experience this!! This is worth the money. It’s very easy to redeem Klook Voucher. Once you get into the ticketing counter, just show your mobile voucher and it’s done. The price is slighly cheper than buying on the spot. Nice service. I got a really stunning experience in Mahanakhon Skywalk. 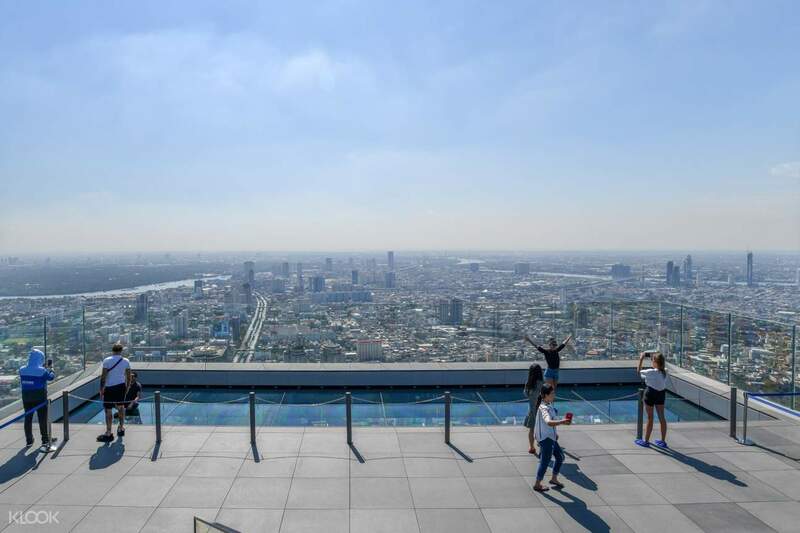 I bought the ticket that can enter the 74th floor indoor observation deck and 78th deck on the outdoor rooftop where i can see the whole Bangkok City from the top. The highest point is 314m, and it is highest in Bangkok now. On the top there is a small cafe/bar that we can order drink and some snack to accompany us enjoying the view. And free WI-FI provided inside the building, just scan your device to the given barcode, no need password. You can come here around 5pm to have a view of Bangkok on day and night, and the extra, you can watch the stunning sunset and the stunning sky color changing. 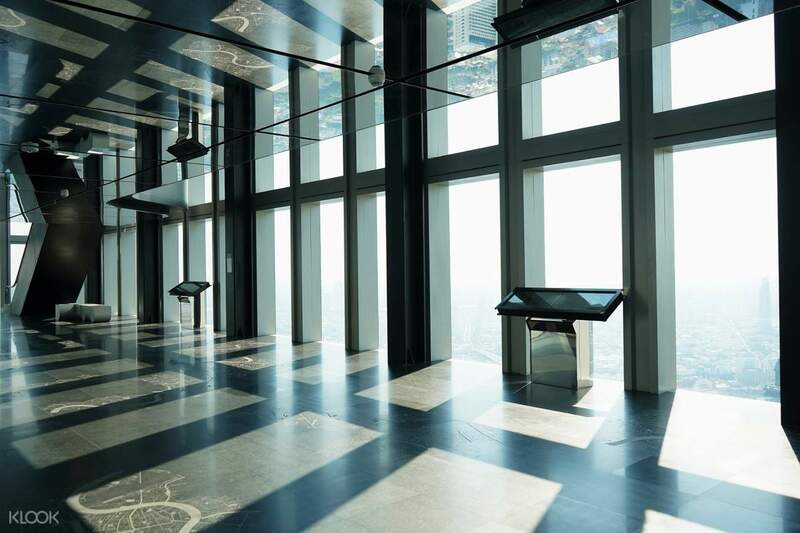 And don’t forget to take picture in the skydeck, you can experience walking in the sky there! After that you must queue for the elevator taking you down. And they have some i guess like duty free merchant inside if you want to do some shopping. It’s very easy to redeem Klook Voucher. Once you get into the ticketing counter, just show your mobile voucher and it’s done. The price is slighly cheper than buying on the spot. Nice service. I got a really stunning experience in Mahanakhon Skywalk. 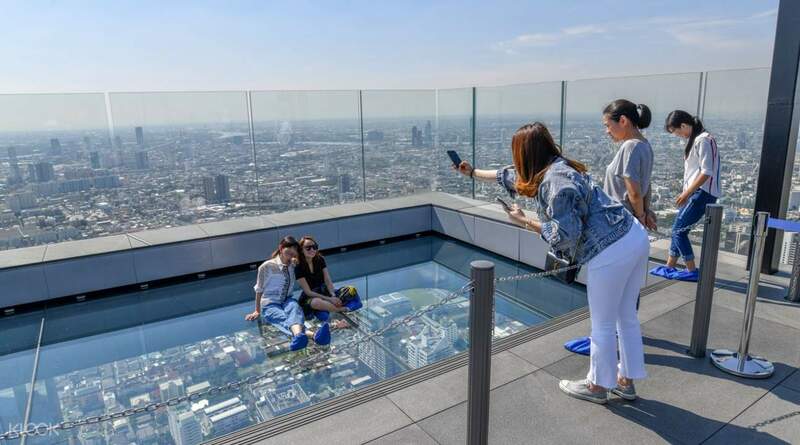 I bought the ticket that can enter the 74th floor indoor observation deck and 78th deck on the outdoor rooftop where i can see the whole Bangkok City from the top. The highest point is 314m, and it is highest in Bangkok now. On the top there is a small cafe/bar that we can order drink and some snack to accompany us enjoying the view. And free WI-FI provided inside the building, just scan your device to the given barcode, no need password. You can come here around 5pm to have a view of Bangkok on day and night, and the extra, you can watch the stunning sunset and the stunning sky color changing. And don’t forget to take picture in the skydeck, you can experience walking in the sky there! After that you must queue for the elevator taking you down. And they have some i guess like duty free merchant inside if you want to do some shopping. One of the best experience! It was fun riding the fastest elevator.imagine you'll be at the 75th floor in less than a minute with 3D videos entertaining you while going up.. And the view the from top is so breathtaking. I guess it would be a perfect place to watch the fireworks.. And the glass tray, it keeps my knees shaking but I'm happy I have overcome my fear of heights. 😂🤣 Thanks Klook! One of the best experience! It was fun riding the fastest elevator.imagine you'll be at the 75th floor in less than a minute with 3D videos entertaining you while going up.. And the view the from top is so breathtaking. I guess it would be a perfect place to watch the fireworks.. And the glass tray, it keeps my knees shaking but I'm happy I have overcome my fear of heights. 😂🤣 Thanks Klook! Amazing view from up there very modern and not many tourist on the time when i arrived (almost sunset) only the haze do spoil the view but still the color of the sunset is even more vibrant with the sun hiding behind the haze! Amazing view from up there very modern and not many tourist on the time when i arrived (almost sunset) only the haze do spoil the view but still the color of the sunset is even more vibrant with the sun hiding behind the haze! One of the best 360° Bangkok’s view is here. We went on January 1, 2019. The cool wind and weather just nice and it was the right moment to begin the brand new day of the beginning of the year. Buy tickets via Klook was best offered. To redeem the tickets, no priority as usual, you have to stay in the long queue as many people. Unlike buying other tickets to visit other skyrise buildings of other countries with Klook. Anyway, it's worth to come here and enjoy the view as long as you want. One of the best 360° Bangkok’s view is here. We went on January 1, 2019. The cool wind and weather just nice and it was the right moment to begin the brand new day of the beginning of the year. Buy tickets via Klook was best offered. To redeem the tickets, no priority as usual, you have to stay in the long queue as many people. Unlike buying other tickets to visit other skyrise buildings of other countries with Klook. Anyway, it's worth to come here and enjoy the view as long as you want.